These lyophilised calibrators from Chromsystems are based on human plasma and should be used according to the instruction manual. 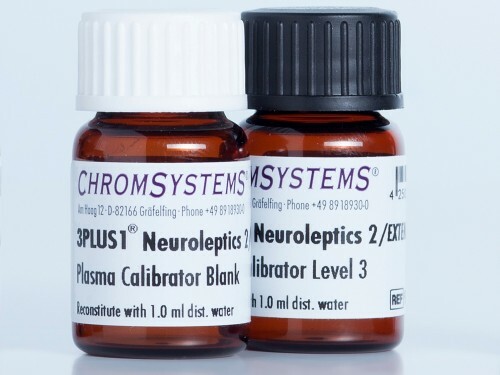 They are designed to calibrate the measurement method in clinical diagnostics for the quantitative determination of neuroleptics 2/Extended in serum/plasma. While following the instructions the calibrators should be handled and measured in the same manner as a patient specimen. Amisulpride 39.1 330 625 n.d.
Chlorprothixene 14.4 194 369 n.d.
Levomepromazine 3.42 99.9 193 n.d.
Melperone 22.0 633 1157 n.d.
Perazine 15.0 268 485 n.d.
Pipamperone 13.7 257 494 n.d.
Promethazine 35.5 261 482 n.d.
Sertindole 10.9 66.4 121 n.d.
Sulpiride 30.4 637 1244 n.d.
Thioridazine 61.2 1218 2333 n.d.
Ziprasidone 14.3 128 238 n.d.
Zotepine 7.81 98.1 183 n.d.
Zuclopenthixol 2.62 64.5 120 n.d. The blank level is manufactured using the same matrix pool as used for the calibrator levels 1, 2 and 3. It was not fortified with any neuroleptics.